I take the proverb very seriously and it was even in our vows that I would continue to plan great menus for the week and cook gourmet meals for my husband when we wed a year ago. For our first Valentine's Day as a married couple I picked Cam's favourites and created a special Valentine's Menu. 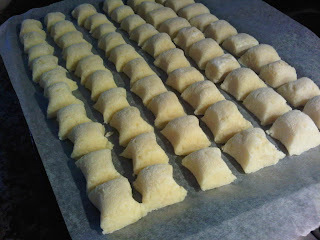 The gnocchi dough was surprisingly easy to make with the help of the potato ricer and I realised the importance of "mis en place" as I came to cook the dish. Everything only took a few seconds so I was pleased I'd taken the time to get everything ready and next to the stove top by the time I threw the gnocchi in the boiling water, and the prawns in the frypan. The next course was Cam's all time favourites: duck. Duck is typically quite a rich meat and being summer I wanted to choose a lighter course, so the duck was served with a warm salad: Duck Salad with Red Wine Dressing. 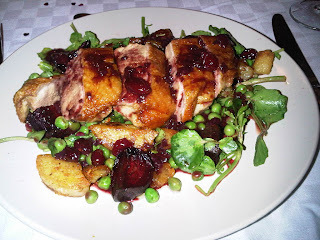 It was a delicious main, full of flavour with a delicious watercress and beetroot salad, with potatoes crisped up in the duck fat. 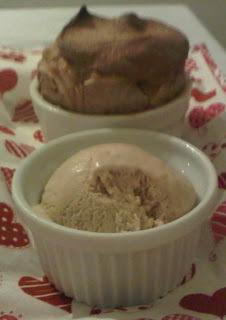 Cam not being a big dessert fan, but a lover of our homemade ice cream, I chose to prepare a challenging (for me) dessert, something that I'd not tried before - Mocha Souffle with my own Coffee Mallow Ice Cream.. I was very impressed with myself that the souffle rose and that the ice cream went so well with it! A light but delicious end to an amazing Valentine's Day meal. Lovely dinner! I am impressed. And I so wish I could say I am not a big dessert fan! But I am and don't think I am changing anytime soon!